The Mississippi Legislative Black Caucus announced earlier this week that it will take a pass on the Southern Legislative Conference, which will be held in Biloxi this summer, in protest against the Confederate battle emblem that is still emblazoned on the state flag. As the Associated Press notes, all eight of Mississippi’s public universities, and several counties and cities, including Biloxi itself, have stopped flying the flag because of the rebel emblem. Most areas implemented the stance following the June 2015 massacre at Emanuel African Methodist Episcopal Church in Charleston, S.C., that left nine parishioners dead. South Carolina itself removed the battle flag from the Statehouse lawn soon after the killings. The chairwoman of the Mississippi Legislative Black Caucus, Rep. Sonya Williams-Barnes, a Democrat, said Tuesday that the boycott is meant to put pressure on state House Speaker Philip Gunn, who said shortly after the Charleston massacre that his Christian faith led him to see the Confederate symbol as “a point of offense that needs to be removed” from the state flag. However, Gunn, who is white, has not yet gathered the votes needed to make a change. Gunn is the chairman of the conference, which has members from 15 states. This year’s annual meeting will be held July 29-Aug. 2. Williams-Barnes told AP that the Black Caucus has not united around a new design proposal. “What we’re really wanting is a flag that charts a different future for our state, that charts a different future for our children and that is about a vision that unites people in the state with each other as well as unites Mississippi with other states in the nation,” she told the newswire. 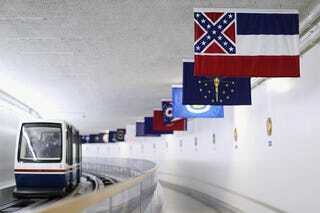 Mississippi has had the same flag since 1894, and voters opted to keep it during a 2001 election. Williams-Barnes said that most of the caucus members voted to boycott the conference, with about 80 percent planning to take part in the boycott. Williams-Barnes is also planning to ask other black legislators from other states to join in on the cause as well.